Tangy and sweet ground pork tomato stew with a hint of garlic and herbs. Quick and easy recipe! Ok. So this is not a typical Chinese nor Asian dish by any stretch but it is one of my children’s favourite dishes which I cook from time to time. Today is one of the many times that I’m obliging their request to cook this dish. The wet and rainy weather in Singapore this morning made this delicious, warm and comforting tomato stew just perfect to cook and eat. 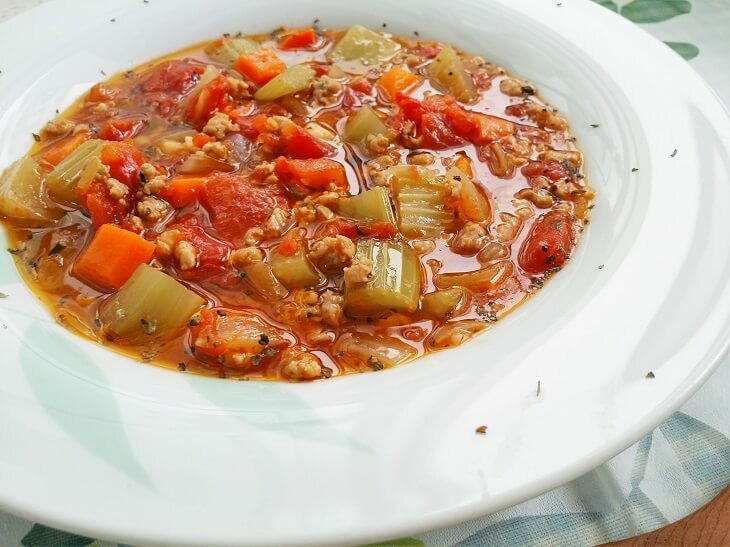 This quick and easy tomato stew uses everyday ingredients like carrot, celery, onion and canned tomatoes which you can easily find all year round. I always have them in the kitchen so when I need to fix a quick meal or I’m just too lazy or tired to cook something more elaborate, this would be fast and easy. But the best part is, for a meal that does not take much effort, it tastes delish and my children love it! What is The Best Canned Tomatoes? Now before you scoff and wrinkle up your nose at using canned tomatoes or canned food for that matter, sometimes what we just want is the convenience and speed. The canned tomatoes that I used for this recipe is by Hunt’s. 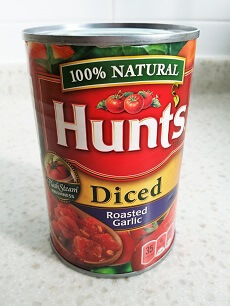 I’ve been using Hunt’s canned tomatoes for years and the Roasted Garlic flavor is my favorite so far. The tomatoes have a nice balance of acidity and sweetness and it is great for pasta sauces and stews. Check out this taste test to see what is the best canned tomatoes in the market. Have you tried any of them before? Which is your favourite? 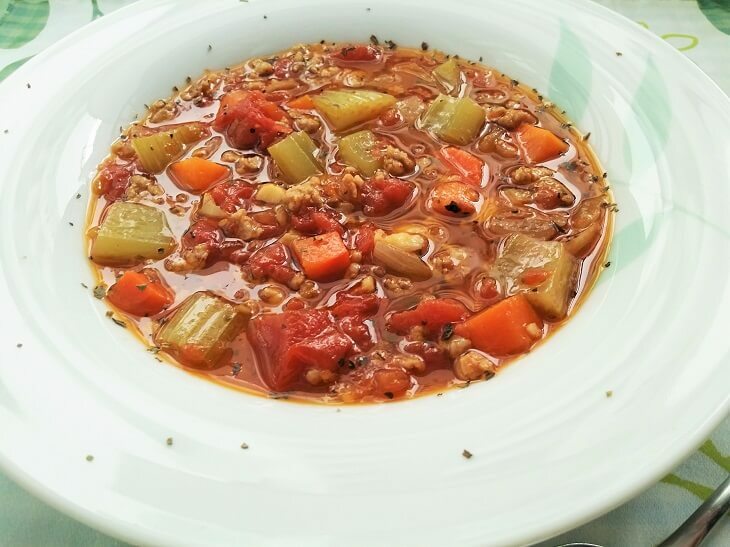 One of the joys of a tomato stew is the juices so be sure not to boil it away. My girls love to drink this stew so much. It’s like a tomato soup for them and they keep wanting more. Lol! I added some dried herbs like oregano and basil for extra flavor in the stew. Feel free to use your favorite herbs. You can eat the stew on its own or pour it over some pasta or spaghetti. A comforting, delicious and quick pork tomato stew. Marinate the ground pork and let it sit while you prepare your other ingredients. Heat up 1 tbsp of olive oil in a medium-sized pot. Add onions and fry till soft and transparent. Then add in garlic and stir-fry for awhile till fragrant. Do not brown the garlic or it will be bitter. Add the ground pork. Using medium heat and a deft hand, sauté and stir the pork with a spatula so that it does not clump. Do this until it is nicely separated. Add in carrots and celery and continue to cook. Sprinkle the dried herbs over the stew. Pour in the Hunt's diced tomatoes followed by water/stock. Stir gently to mix everything well. Bring to a boil. Then reduce heat, cover with lid and simmer over a small flame for about 10-15 minutes until the ingredients have softened. Garnish with dried herbs and serve hot. This looks simple and delicious! 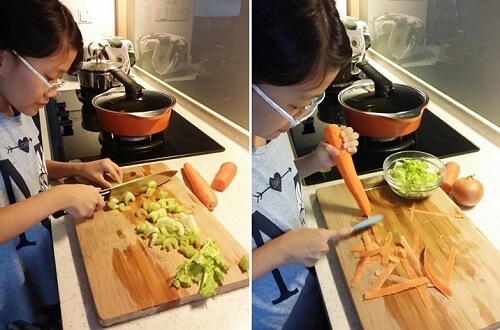 My kids love to help me in the kitchen as well, and then they are much more likely to eat the meal because after all, they made it! Thank you for the recipe. Yes, it’s true! They will be more likely to eat the food they helped prepare. This is especially useful when it comes to picky eaters. I let my children choose the ingredients (usually healthier options) so they know exactly what goes into their food. Thanks for visiting. This looks really simple but really delicious! 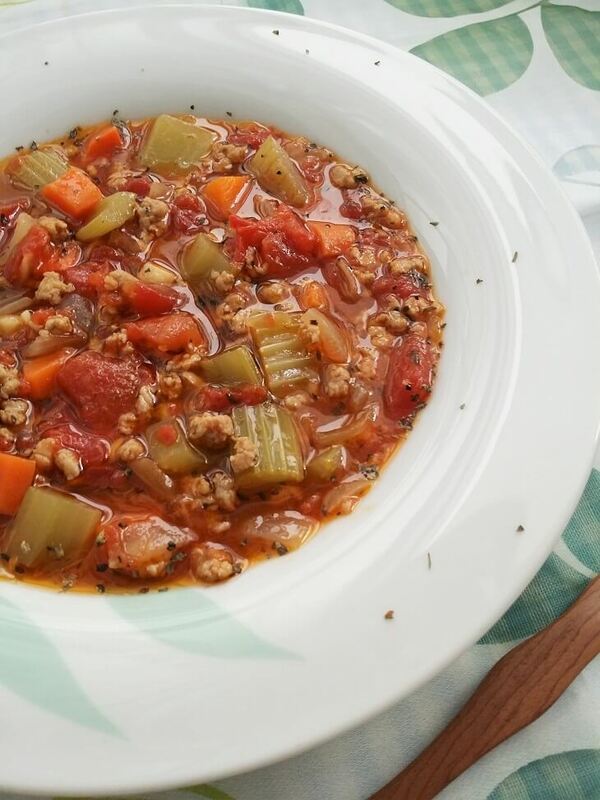 I love using ground meat in stews, it’s such good comfort food. The soup in the picture looks amazing! I will have to give this a try soon, it looks so easy. Thanks for your comment, Jeremy. I hope you’ll like the recipe!